History. The story of Dumfries House and Estate from the 18th-century to present day. Knight of the Order of the Thistle (1752) and heir to his mother’s title, William Crichton-Dalrymple retired to his Ayrshire Estate after resigning his commission from the army in 1743. 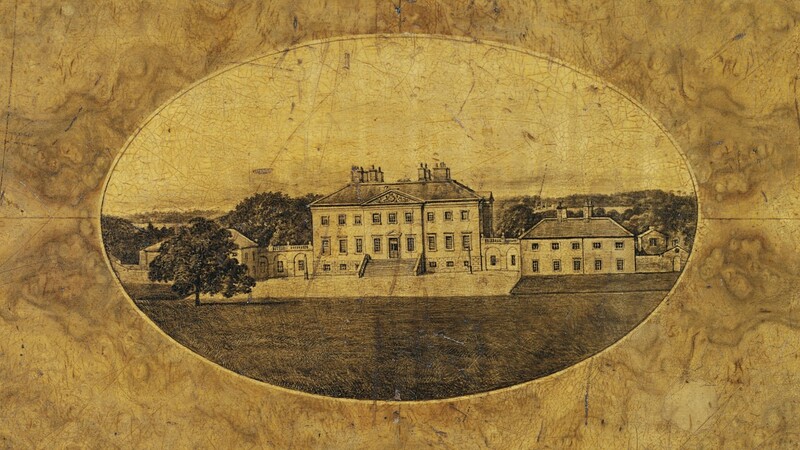 Early mention of plans to build a new house on the Estate finally came to fruition when the young Adam brothers, John, Robert and James submitted their completed drawings in 1754. After the death of his wife in 1755 the Earl furnished the house single-handedly drawing largely on the rococo style, both English and Scottish, and thereby created one of the most treasured interiors of the Scottish Enlightenment. A year after the building of Dumfries House had begun, Lord Dumfries’ wife, Lady Anne Gordon died. Although the Earl mourned her death deeply, he did not abandon the building project, and soldiered on. Highly discerning and design conscious, he had a vision for his elegant new house and spent considerable sums on creating modern, colourful and stylish interiors. In addition to a large commission from the Scottish wrights Alexander Peter, Francis Brodie and William Mathie, the Earl hand-picked the finest furniture from Thomas Chippendale’s workshop in the heart of fashionable London. The Earl, whose first son had died at the age of ten, was loath to leave his titles and estate in the hands of strangers. He was hopeful that his beautiful new house may help attract a new lady into his life in order to finally produce the much desired heir. In June 1762 Lord Dumfries married Anne Duff, a distant cousin. In October of the same year a visitor to the house noted ‘that Colonel Montgomery expelled from Dumfries House for being behind the curtain with the new Countess’. This suggests an attractive wife, but perhaps also that the marriage was not a great success. Six years later the fifth Earl died. With there being no issue, the widow had little entitlement and remarried herself. The substantial Estates were inherited by the Earl’s nephew, Patrick Macdouall, who reluctantly gave up a career in the army in order to settle at Dumfries House. With Dumfries House, Robert Adam and his two brothers John and James received their first independent commission for a complete house after the death of their father William Adam in 1748. It was Robert who would go on to be recognised as the more talented architect, and John, as the eldest of the brothers, who headed up the family business, Six years later, the contract signed and the design agreed, the foundation stone was laid on the 18th of July. With construction work well underway Robert set out on his Grand Tour of the continent a few months later, leaving John in charge of the building works. The House was completed on time and on budget in 1759. Following the death of his uncle, 5th Earl of Dumfries, Patrick McDouall-Crichton (1726-1803) inherited the Dumfries House Estate. The new Lord Dumfries married Margaret Crauford, the daughter of Ronald Crauford of Restalrig and for the next 35 years they set up home on the Ayrshire Estate. 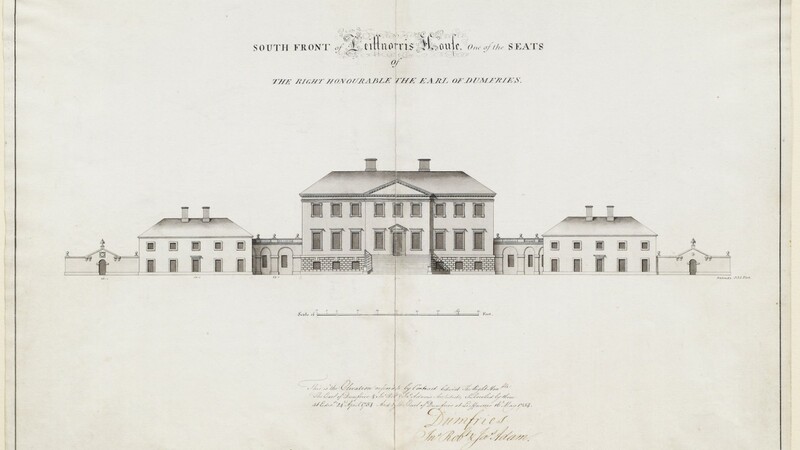 In 1771 they demolished the original house on the estate, Leifnorris House. A year later, in November 1772 the couple’s daughter Lady Elisabeth Penelope was born. Lady Elisabeth and John, Lord Mount Stuart, the eldest son of the 1st Marquess of Bute, fell in love with each other and the couple’s marriage in 1792 sealed the link between two of Scotland’s leading families – the Crichtons and the Stuarts. Their life together was tragically short-cut by Mount Stuart falling from a horse two years later, leaving his first born son and pregnant wife. Elisabeth and her two children lived with the maternal grandparents at Dumfries House. The elder of the boys, John, was to succeed his maternal grandfather as the 7th Earl of Dumfries in 1803 and his paternal grandfather as 2nd Marquess of Bute in 1814.